Here is your free lesson in Dowsing. You will learn how to get a response from a pendulum and a dowsing rod. In the early stages of learning you will not need to purchase either of the above items. You will probably have materials in your home to enable you to make them. It is defined as locating a target (a source of water/minerals, earth energy lines) using various implements at our disposal and using our right brain (the intuitive side) to obtain an answer. At the present time science cannot confirm or deny the findings of dowsing results, but please consider the practice has been going on for thousands of years across the world. WHAT DO WE NEED TO START WITH THE FIRST FREE LESSON? Make your Own Dowsing RodsHave you a pair of metal coat hangers in your wardrobe that you no longer need? If not, two welding rods or a couple of long pieces of thin metal round bar 3 to 4 mm thick. If you are still struggling and cannot find anything look at the dowsing shop page. Here we will make a pair of ‘L’ shaped rods. This is easily done with a coat hanger. See illustration. Congratulations, you are now the owner of your first pair of home made dowsing rods. HOW DO WE USE THE DOWSING RODS? It can get very complicated using words to explain this technique, but the best thing is seeing someone dowsing or view a picture. Trust me! It will save both of us a lot of time and brain power. 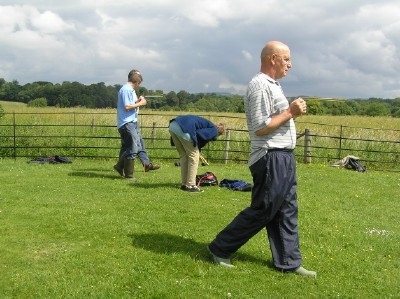 Below is a picture of myself dowsing the Michael Current at Knowlton Ancient Church. Still focusing on the tips of the rods, deliberately make your rods form a cross in front of you ( X ) keeping your elbows by your side and arms straight out in front. Say to yourself “This is my Yes position”. Now turn the rods back to the Ready Position (elbows by your side and arms straight out in front, like the picture) then say to yourself “Show me my Yes position” See in your minds eye both rods crossing. Regardless of your response, start at the beginning and practice again. Some people achieve an instant response whilst others take a little longer. REMEMBER: Everyone can dowse. From here things get a bit easier, all we need to do now is to find our “No Position”. The procedure is the same as the Yes response but this time instead of making the rods cross we take them from the ready position to a point facing left and right. So the right hand rod turns 90 degrees and the same with the left hand rod. Now follow the same procedure as above:- Say to yourself “This is my No position”. Now turn the rods back to the Ready Position (elbows by your side and arms straight out in front, like the picutre) then say to yourself “show me my No position” see in your minds eye borth rods moving out at 90 degrees. Keep practising this procedure every day until you can get a good response. Then and only then, start asking a few simple questions like is my name XXXXXX (your correct name and then an incorrect name). Observe the response that your rods are showing. Ladies, do you have some kind of broach or pendant on a chair or cord? Lads, go to your your workshop/tool box and get a 10mm or so nut. Tie a bit of cord to it, bingo, you have a pendulum. Again, if you are struggling go to the Dowsing Shop Page. It is important to hold the pendulum chain/cord correctly so as not to interfere with the swinging motion. Use either hand you feel comfortable with, hold the chain/cord between thumb and first finger and allow it to drop in a downward position, not over your thumb or finger. A good guide to see if you are holding it corectly, is seeing all of the back of your hand. Hold the chain/cord about 4 to 5 inches from the pendulum. You are ready to ‘train’ the pendulum to a READY, YES and NO response. Like the ‘L’ rods which have a “Ready Position” the pendulum is no differnt. Hold the pendulum as described and away from your body slightly. Deliberately and slowly start the pendulum swinging in a foward and backward movement. This is your “Ready Position” Focusing on the pendulum, say to yourself “This is my Ready Position” See in your minds eye the pendulum going forward and backward. There is no fixed criterion relating to which direction the pendulum swings for your Yes or No response. I would suggest you deliberately swing the pendulum in a clockwise direction and focusing on the pendulum, say to yourself “This is my Yes Position. See in your minds eye the pendulum going in a clockwise direction. This is the same as the Yes procedure, although this time you will swing the pendulum in an anticlockwise direction. Now swing the pendulum in an anti-clockwise direction and focusing on the pendulum, say to yourself ‘This is my No Position” see in your minds eye the pendulum going in an anti-clockwise direction. If you feel more comfortable using your left hand, do so, there is no right or wrong in dowsing. Repeat these exercises until you become proficient in using the Rods and Pendulum. Once this is acheived you are ready for the next steps. It is easy to influence the answer which is given. For example, you may ask a question, but your thoughts are wanting the question to be a yes, therefore influencing your results. Keep your mind neutral, concentrate on the question you are asking.